From the "New York Times" best-selling author of "Commencement "and "Maine" comes a gorgeous, sprawling novel about marriage about those who marry in a white heat of passion, those who marry for partnership and comfort, and those who live together, love each other, and have absolutely no intention of ruining it all with a wedding. Evelyn has been married to her husband for forty years forty years since he slipped off her first wedding ring and put his own in its place. Delphine has seen both sides of love the ecstatic, glorious highs of seduction, and the bitter, spiteful fury that descends when it's over. James, a paramedic who works the night shift, knows his wife's family thinks she could have done better; while Kate, partnered with Dan for a decade, has seen every kind of wedding beach weddings, backyard weddings, castle weddings and has vowed never, ever, to have one of her own. As these lives and marriages unfold in surprising ways, we meet Frances Gerety, a young advertising copywriter in 1947. Frances is working on the De Beers campaign and she needs a signature line, so, one night before bed, she scribbles a phrase on a scrap of paper: A Diamond Is Forever. And that line changes everything. 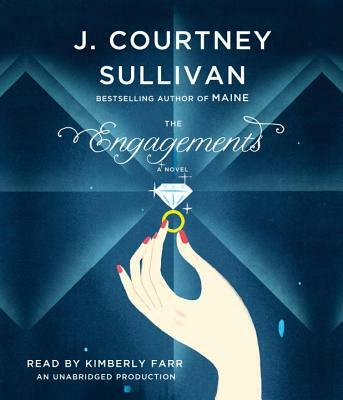 A rich, layered, exhilarating novel spanning nearly a hundred years, "The Engagements" captures four wholly unique marriages, while tracing the story of diamonds in America, and the way for better or for worse these glittering stones have come to symbolize our deepest hopes for everlasting love. J. COURTNEY SULLIVAN is the author of the New York Times best-selling novels Commencement and Maine.Maine was named a Best Book of the Year by Time magazine and a Washington Post Notable Book for 2011. Her writing has also appeared in The New York Times Book Review, The Chicago Tribune, The Wall Street Journal, Glamour, Allure, Real Simple, and New York magazine, among others.